Although previous articles have covered the basics of intervertebral disc injuries, as well as some other more unusual spinal injuries, I have been told that I have neglected to give a good overview of the more common spinal surgeries. Certainly it would be impossible to cover all the possible surgical procedures one might encounter in a case involving a spinal injury, but I can certainly provide a brief orientation to the surgeries most commonly seen in this type of litigation. These procedures include cervical, thoracic and lumbar surgeries, both anterior and posterior exposures, and everything from laminectomies and discectomies to foraminotomies and fusions. the discs and various intricacies of the vertebrae, it is easier to first understand the simple basics of the spinal cord and nerve roots since the vast majority of these surgeries boils down to stabilizing or relieving pressure on these nerves. Think of the spinal cord as a major highway that runs its entire course within a tunnel. This tunnel is the spinal canal formed by the rings within the various vertebrae that are stacked one below the other from the skull all the way down to the pelvis. Think of the nerve roots as exits from the spinal cord highway that need to emerge from the tunnel of the spinal canal. These nerve roots exit through foramen, or channels, on either side both right and left where every two vertebrae come together. The surgeon’s primary concern is maintaining the flow of traffic through this highway and on these exits, making sure that the spinal cord and nerve roots are not compressed or pinched. Let’s talk about the four most common types of spinal surgery first. These are laminectomy, discectomy, foraminotomy and fusion. We’ll deal with each separately although there is some crossover and any combination of these might be performed in the same surgery. • Laminectomy – While the vertebral bodies and discs lie anterior to the spinal cord, the laminae are the flat shields of bone that form the posterior (back) border of the spinal canal. They normally protect the spinal cord from being damaged from direct impact from behind. If the disc protrudes beyond its normal location back into the spinal canal, the spinal cord can become compressed between the protruding disc material and the laminae. A laminectomy, or removal of the laminae, can be performed to decompress the spinal canal and give the spinal cord a bit more room to move around. This may be all that is required to relieve the problem. More often, the laminectomy is performed not so much for decompression, but rather to allow the surgeon to access the deeper structures within the spinal canal, to create a doorway. Variations of the laminectomy are the hemilaminectomy when only the right or left half of the laminae are removed, and the laminotomy in which only a window of bone is removed from the lamina. 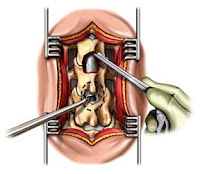 • Discectomy – This procedure is simply the removal of all or part of the damaged intervertebral disc either because it is bulging or herniated back into the spinal canal. This can be done from the front (anteriorly) or from behind (posteriorly). The anterior approach is generally preferred in the cervical spine (neck) since it allows the surgeon to access the disc without having to manipulate or go around the spinal cord and therefore avoiding damage to the cord. On the other hand, even though the spinal cord has to be manipulated, a posterior approach is traditional in lumbar (lower back) cases since this approach avoids the issues of the abdominal structures and major vessels that lie anteriorly. But, over the years, anterior approaches in lumbar cases have become more and more common. Today you may be just as likely to encounter an anterior lumbar procedure. • Foraminotomy – This procedure is simply an enlargement of the neural foramen, the channel through which the nerve roots exit the spinal canal. This passageway may be narrowed due to herniated disc material or by degenerative arthritis that manifests as an overgrowth of bone. Regardless, for one reason or another, if the foramen becomes narrowed it can put pressure on the exiting nerve root. This can lead to severe pain and neurological dysfunction. To relieve this condition the surgeon must access the foramen and scrape it out removing the offending disc or bone material. • Fusion – Certainly there are more types of spinal fusion techniques than I can count on my fingers and toes combined. It seems that every year there are new hardware and materials being developed and new techniques associated with each. But let’s stick with the basics. 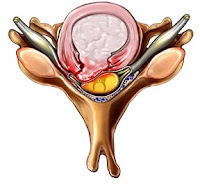 If a disc is damaged and must be removed or if the interspace between two or more vertebrae is unstable, a fusion can be performed to make a permanent connection between two or more vertebrae. The eventual goal of any fusion procedure is to actually get the bone of the fused levels to grow together, using the power of the body’s own healing ability to create a strong connection. But this takes time, so a variety of hardware can be employed to temporarily stabilize the fusion site while the bone growth takes place. This hardware may consist of devices placed within the disc space, or plates, screws and rods placed either anteriorly or posteriorly. Due to the variety possible, I will publish future articles dealing with this topic in more detail. Finally, I will mention a few additional procedures that, although not as common as those described above, may be encountered from time to time in your practice. A corpectomy is the complete or partial removal of a vertebral body. A kyphoplasty is the injection of cement or other synthetic material into a compressed or collapsed vertebral body to restore the proper height and alignment. Intradiscal electrothermal (IDET) therapy is the insertion of a wire or coil into a damaged disc that can be heated to cause the disc material to contract and relieve nerve compression. A disc replacement is the placement of a mechanical device into the disc space to restore stability without the loss of flexibility caused by traditional fusion. Click on any of the links above to see examples of the various procedures discussed in this article. This is extremely informative, some of it was things I really didn't understand until now. great video. .very informative and relevant . .
Did your Neurologist do an EMG yet to see if a neural is being pressurized in your hands or leg yet. I would also obtain a Orthosurgeon or Neurosurgeon to see what their cure is and can let you know if it`s necessary to have surgical procedures. Get more than one viewpoint and trust you may obtain a Dr. to help soon. I am looking for such a post, thanks for sharing such valuable information.